We here at Magnificent Moments Weddings love when things are easy! I mean who doesn’t? So this month we decided to shine our vendor spotlight on Brideside. Brideside is a unique dress boutique focusing on bridesmaids dresses. What makes it so unique? Well, that would be its concierge service! That’s right, when you shop at Brideside you get a style consultant who is with you through the entire bridesmaid dress selection process. I told you it was easy. To find out more about this amazing service we sat down with Amanda Parker, the Regional Stylist Manager at Charlotte’s Brideside to get all the details to share with you! What is the Brideside experience? Brideside is a multi-channel, concierge service, designed to make the bridesmaid dress buying process simple! The Brideside experience enriches one of life’s most joyous occasions by providing beautiful products, expert knowledge and personalized customer service. We focus on creating peace of mind for all of our customers in a comfortable, enjoyable environment. How do style consultants fit into the overall process? Whether you sign up online or visit one of our showrooms, you are designated a style consultant who will work with you throughout the process. 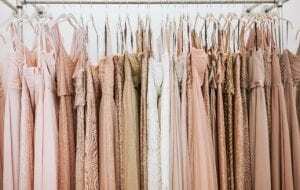 This is a complimentary service offered to make bridesmaid dress shopping as easy as possible for the bride and wedding party. Our style consultants do everything from helping the bride narrow in on her vision, to helping the bridesmaid pick the best size to order. How does shopping with Brideside differ from other dress boutiques in the area? ​In addition to our complimentary style consultants, we offer a try at home, sample program. This is especially helpful for ladies who don’t live near a showroom. Brides can utilize it to see styles and colors & bridesmaids utilize it to find their style or size. We also just launched our private label collection, so we offer styles no one else has. AND we recently launched our gifting suite with curated options for the bachelorette party, bridesmaids, and brides. What are some tips you would give a bride as she starts the process of picking out dresses for her bridal party? One of our first tips for brides is to find their dress before shopping for the bridal party. Her dress will set the tone and vibe for her wedding! Another tip we give our brides is to have their bridesmaids order their dresses at least 8 months out from their wedding date to allow time for any alterations. Can you share a past brides experience that really stood out to you? ​We recently worked with a bride, who lived in out of state, and we were able to chat with her over Facetime to coordinate colors and styles for her bridal party. She never stepped foot into a showroom! What is your current favorite dress you offer and why? We are currently loving the Rachel style from our private label collection! It is quickly becoming a top seller for us. The style is super flattering and looks great on all body types. As you can see, Brideside really is a one-stop shop for all your bridal party needs. Plus their style consultants are so great at simplifying the bridal party dress shopping process. Be sure to check out their website or visit their location in Charlotte soon! And want to see some real weddings our brides have used Brideside to help with? Amy selected gorgeous dresses and Jackie did too! Want more tips on how to make wedding planning a breeze? Contact Magnificent Moments Weddings today! We would love to help you plan you big day!